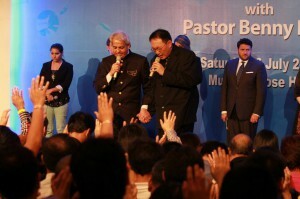 On the 6th of July 2013, my friends and I attended the Benny Hinn meeting at Jakarta. The meeting was conducted by Nafri Allah Ministry at the Kuningan city mall. I was one among the invitees, for the breakfast session with Pastor Benny Hinn at the Grand Hyatt hotel. After breakfast, he came to our table, gave us a warm hug and made us feel welcome. Since there were only 10 of us, he invited us to his room. He shared his personal story and experience of his family life and ministry. Later he prayed for each one of us individually. 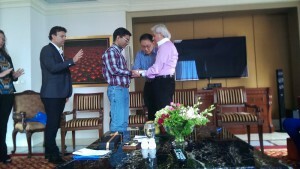 It was an awesome moment as he laid hands on me and prayed. At 5:30 pm, we went to the hall where the service was being conducted. The security was tight. The baggage were screened before entry into the hall. The service started at 6 PM with beautiful praise and worship in the Indonesian language. After praise and worship by the Indonesian choir, Pastor Benny continued the worship. The Presence of God was beautiful beyond description during worship. He first shared the message on salvation. The only guarantee we will go heaven is God’s promise. The Bible tells us to make our election sure. We cannot play with eternity. It’s not a trivial thing. He asked the audience, how do we know whether we are really saved? There are 4 conditions for salvation. When Jesus came to Caesarea, Philipi, He asked the disciples, who do man say I am? They answered, some say John the Baptist, some say Elias, some say Jeremiah. Jesus asked who do you say that I am? Peter said you’re the Christ, Son of Living God. Peter stood face to face with the living Christ. That is the first foundation without which no one can be saved. He asked, have you ever had a face to face encounter with the Living Christ? Speaking in tongues, or attending a Pentecostal church doesn’t guarantee you will go heaven. He shared his own personal experience of how he had a face to face encounter with Jesus Christ on Feb 14, 1972, in the corner of a room in a library. He mentioned many people come to Christ just to escape from fire. Jesus is not a fire escape. You don’t receive Jesus to escape hell but you receive Him because you love Him. A face to face encounter is a must. The second important thing is the revelation from the Holy Spirit that He’s the Messiah. Every religion has a Christ but there is only one true Messiah and His name is Jesus. The Angel of the Lord, told Mary “Thou shalt call His Name Jesus”. Only the Holy Spirit can reveal this to the hearts of the men. You cannot get this revelation by reading books or watching TV channels. The revelation can be received only by the Holy Spirit. The third condition is that we must acknowledge Him with our mouth – Thou art the Christ. The fourth condition is we must acknowledge Him publicly for the rest of our life. Paul says, I am not ashamed of the Gospel of Christ. Jesus said ” I am the way, the truth and life, no one comes to the Father but through Me”. Jesus is the only man that died and rose again. Because He rose from the dead and is alive, it qualifies Him to be our Savior. We must give our life to Jesus. At the cross, He gave His life and now we must give our life to Him. It’s an exchange of lives. When you give your life to Jesus, it means you are saying, I trust you with my soul, spirit and eternity. I trust you with every part of my being. Jesus said If any man would come to Me, I would not cast Him off. I will receive him to myself. That’s a great comforting promise. Pastor Benny invited the people who wanted to accept Jesus as their Savior to come forward. The moment he gave the invitation, people ran forward in great number. We were seated at the third row from the stage and were stunned to see the multitudes of people accepting Jesus as their Savior at the very first altar call. Then he led the people to pray the sinner’s prayer. After the altar call, there was a beautiful worship time – “You’re beautiful beyond description”. The anointing was rich and powerful. After the worship, Pastor Benny continued preaching Jesus, the Son of God – He’s beautiful beyond description, He’s awesome. Our words cannot tell it all. He’s the source of the fullness of life. The blessed Word of God is the source of life and beauty. John received the revelation of Jesus. In the Beginning was the Word, the Word was with God and the Word was God. In Him all things stand. All things exist in Him. He’s the creator. God Almighty Himself is the revelation. God said to Moses, I am who I am. To Abraham, He revealed Himself in a different way. Pastor Benny mentioned there are 12 different revelations from God to the humanity – Elohim, Jehovah, Adonai, El-Shaddai, Jehovah Rapha, Jehovah Jireh, Jehovah Mikadesh, Jehovah Tsidkenu, Jehovah Nissi, Jehovah Shamma, Jehovah Shalom. All these revelation is only a glimpse of who God is. God is bigger than those 12 names. He’s eternal being. God wants to reveal Himself to the humanity. The entire story of Gideon is a simple revelation. At every revelation, we see a side of Him. He is way deeper than the truth in the Scriptures. Jesus is bigger than any book you can write, any message you can preach. God is bigger than our minds can comprehend. He is the eternal revelation. He is the totality of life, the totality of Grace, mercy, love, faithfulness, compassion and so on. And every revelation of Him is so fully packed that all the revelation of Him is called the Word. It is not “Revelation”, it is “Revelations”. There is no end to those revelations. He asked the audience, do you know why angels in heaven cry Holy Holy continuously? It is because every time they see a new revelation, they cry Holy, Holy ! He is constantly revealing Himself. God revealed Himself to Adam, Noah, Abraham, Issac, Jacob, sons of Jacob, Joseph, Moses, Joshua, Judges who ruled, Samuel and so on.. Every revelation to man was not fully understood. They were looking Him as if through a fog. Every revelation brought God closer to human heart. Pastor Benny then explained how God revealed Himself to Abraham, Moses and Israelite and finally one day He took the form of man – spirit, soul and body. The Holy Spirit came upon Mary. Jehovah became flesh and they called Him Jesus. He’s the child of Holy Ghost. He’s the totality of all that God is. It’s beyond description that God should become a seed. The eternal revelation was deposited in the womb of a girl. The Holy Spirit, took God the eternal being, and turned into a seed in the womb of Mary. That is why Jesus is called the Child of Holy Spirit. Jesus not only knows the scriptures, He’s the scripture. Jesus preached and healed. He raised Lazarus from the death. When Jesus was crucified, He commended His Spirit to God. After 3 days, Jesus rose from the death. When the Holy Spirit revealed to Apostles after the resurrection, everything changed. At around 9:50 pm, He led the people into worship. People were transported into the Presence of God. The people who were sick received healing and came forward to share their testimony. One memorable incident was a man who came directly from the hospital to attend the meeting with an expectation of miracle from God. And he shared the testimony of how he received his healing. There was a huge line of people waiting to share their healing stories. After the healing testimonies, Pastor Benny invited me and my friends to come on stage. It was an exciting moment. The Presence of God was awesome at the place where I was standing. As he touched us gently, we fell under the Power of God. It was 11 pm when the service ended. The next day afternoon, we boarded the flight back to Singapore.